ALL-NEW 250cfm Stromberg BIG97 available now! We’ve been talking about our new BIG97 for far too long already. But now they’re available. Here’s the press release to start with. And we’ll be posting far more (i.e. everything we’ve got!) in the coming days and weeks. Please stay tuned! May 2015. New BIG97 makes traditional carburetion available to a new performance audience. Stromberg Carburetor is excited to announce the all-new BIG97 Tri-Power. On the outside, it’s all Genuine 97 – the original hot rod 3×2. But on the inside, an incredible 750cfm air flow makes traditional hot rod carburetion available to a whole new performance audience. Designed on the classic Primary/Secondary format with many new and exclusive features, the all-new BIG97 Tri-Power is the perfect bolt-on for your performance small block Chevy or Ford. From the outset, Stromberg’s aim was to re-engineer the 97 venturi and throttle body to maximize airflow without changing the signature outside shape. But achieving as much as 250cfm per carburetor – some 55% more than a regular new 97 (at 162cfm) is only part of the story. The BIG97 Primary carburetor has a new power valve, located in the fuel bowl. Feeding top end enrichment directly into the emulsion tubes, it significantly improves fuel conditioning for more horsepower on less fuel. How? Because the more it emulsifies the fuel, especially at high rpm when manifold pressure is low, the easier it is to atomize, distribute and burn. At the same time, an oval cut-out, just under the throttle plates (Stromberg’s ‘early plenum effect’ ) coupled with our recommended intake manifold modifications, boosts top end power by slowing the mixture down and allowing any cylinder to draw from both barrels. BIG97 Primaries also come with a swap-in fitting to provide ported vacuum for your aftermarket distributor, improving combustion efficiency in cruising mode for more torque and improvements in fuel mileage too. Finally, everything that’s made the Genuine Stromberg 97 so popular over the past ten years is built into the all-new BIG97: An early style cast iron base for low heat transfer. A reinforced air horn casting to eliminate warping and leaks. High tech gaskets. Stainless steel levers, linkage and springs. Original-style riveted throttle and choke shafts. And more. 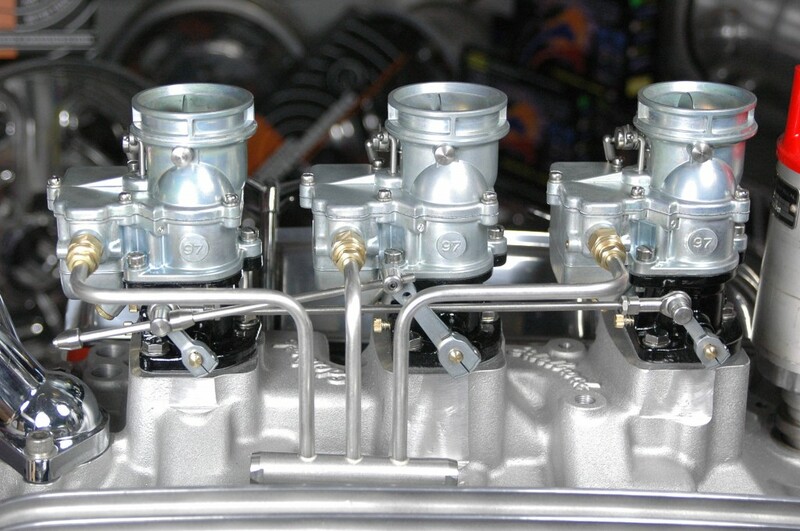 Stromberg BIG97 Primary and Secondary carburetors are available separately or as a ready-to-run Tri-Power (one Primary and two Secondaries), with extra savings available on packages with Stromberg’s exclusive Small Block Chevy linkage and fuel line. The new Genuine Stromberg BIG97 Tri-Power is available through the worldwide Stromberg dealer network. Further details and help with installation is available at www.stromberg-97.com.